The Master of Education in Counselor Education program has two professional counseling tracks: Clinical Mental Health Counseling (CMHC) & School Counseling (SC). Clinical mental health counseling is a distinct profession with national standards for education, training and clinical practice. Clinical mental health counselors are highly-skilled professionals who provide flexible, consumer-oriented therapy. They combine traditional psychotherapy with a practical, problem-solving approach that creates a dynamic and efficient path for change and problem resolution (https://amhca.site-ym.com/page/facts). The Clinical Mental Health Counseling track is a 60 credit hour program. School counselors are certified/licensed educators with a minimum of a master's degree in school counseling, making them uniquely qualified to address all students’ academic, career and social/emotional development needs by designing, implementing, evaluating and enhancing a comprehensive school counseling program that promotes and enhances student success (https://www.schoolcounselor.org/parents-public).The School Counseling track is a 48 credit hour program. Both tracks require that all students successfully complete a range of program requirements. These experiences include satisfactory completion of coursework and course experiences, development of basic counseling skills, acceptable performance in practicum and internship, and a demonstration of specific clinical competencies beyond class requirements. Hold a bachelor's degree from an approved institution with a grade point average of at least 3.0 on the course work attempted. Note: a 2.7 undergraduate grade point average, or 3.0 on the last 60 hours, may allow one to enter on a probationary basis. The School Counseling track provides students with the academic and field experiences needed to serve as a professional licensed school counselor at the elementary, middle, or high school level. The Clinical Mental Health track qualifies students to sit for the National Counselor Exam (NCE). Pending successful passing of NCE, one then becomes a Provisional Licensed Professional Counselor (P-LPC) and may work for agencies that utilize the services of counselors. 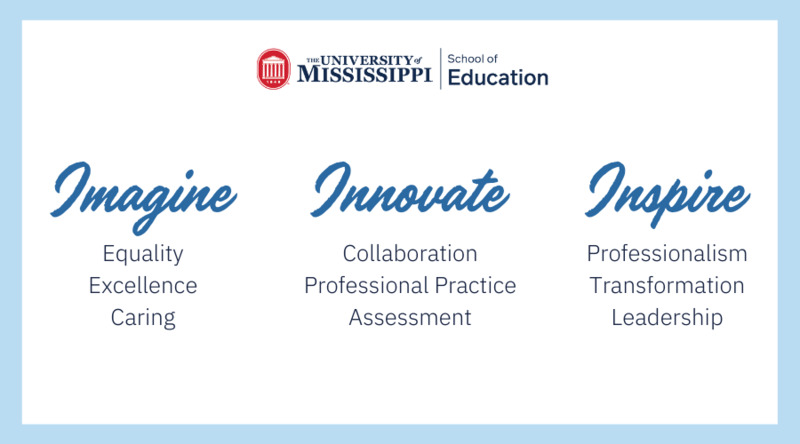 After 3,000 hours of supervised practice, one can take the National Clinical Mental Health Counselor Exam (NCMHCE) and apply with the Mississippi State Board of Examiners for Licensed Professional Counselors for their full state license as a Licensed Professional Counselor (LPC). Courses in the CMHC and SC track may be taught in formats: traditional or in-person, online, or hybrid (partially online and also in-person). The format of the classes vary depending on the course content, instructor, and student needs. Currently, the program is offered on the Oxford campus, as well as the Tupelo Regional Center.